We love homemade gifts in our house. Personalization makes any gift sweeter. 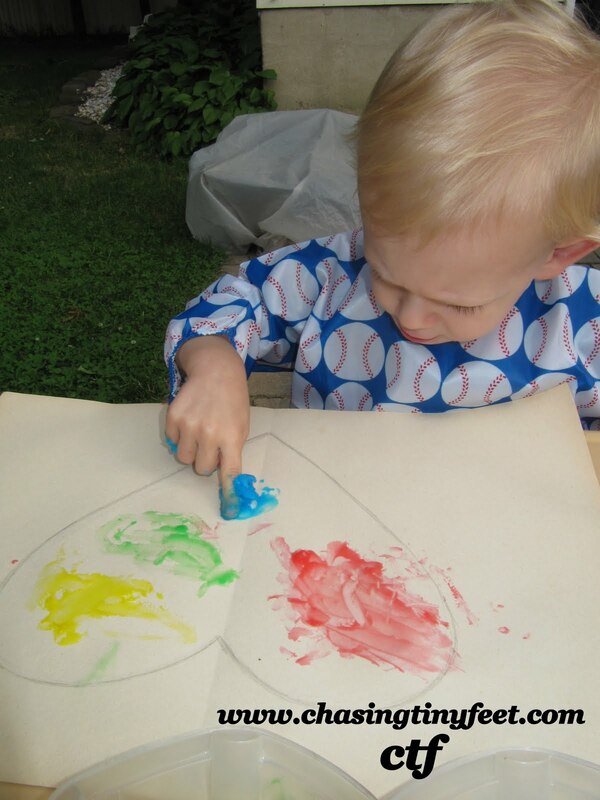 This Father's Day, Mason will be making his first Father's Day Card using the finger paint recipe below. Not only is this a great way to get your child involved in celebrating holidays, but this is a money saver too. By making your own paints, you can save a ton of money since most of the materials needed you already have on hand in your house. I know kids go through paints quickly, so it only makes sense to make your own. An added bonus is that you can experiment with many types of paint. Try them out and have some fun! 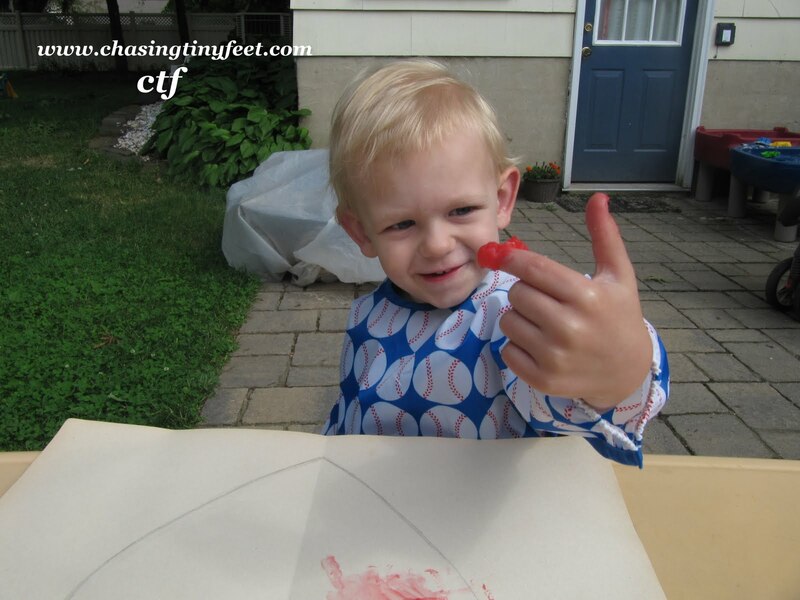 In addition to a great sensory experience, finger painting helps your child develop fine motor skills. **This is very watery when you begin, but be patient, it will thicken up. Also, make sure you stir CONSTANTLY on low heat or lumps will form. Try this paint for a variation with texture! Mix the paint and past together. Add in the starch gradually until you reach the desired consistency. Save some money and make your own watercolor paints. You can use empty egg cartons for paint tins. Add the remaining ingredients. Pour into molds and let harden. Get more ideas like this from the The Everything Toddler Activities Book: Games And Projects That Entertain And Educate . I'm back with two more new product reviews from the hit children's TV series, Dinosaur Train. This week Mason and I played with Hatchers and the Dino Track Discovery Pack. "Growies", as we call them in our house, are very popular. Mason has growies from fish to zoo animals. I knew Dinosaur Train's Hatchers would be a hit since it is similar to a "growie". This toy is based on the Dinosaur Train character, Mrs. Pteranodon. "While sitting on her nest she heard a scratch...and exclaimed “Oh boy! My eggs are hatching!” Now your child can experience eggs '"hatching" too. We carefully removed the egg from the packaging so that it would not break or crack before placing it in a large glass of water. Mason was so excited to help me place the egg in the water. He waited patiently for the egg to "hatch", so I explained to him that it would take a day or two for the egg to crack. He understood it enough that he would check back with me periodically and ask for the "ROAR". I showed him the egg several times until it started to hatch. Once he saw the egg cracking he became very excited and wanted to removed the egg shell from the glass so he could play with his new friend. The Dinosaur Train Hatchers will grow 4 times the original size! You can even remove the dinosaur from the water, letting it return to its original size. Then you can put it back in water to grow again. There are four characters available in the Hatchers, including Buddy, Tiny, Shiny, and Don. Hatchers are suggested for children ages 4 and up. They retail for approximately $4.99. This week, Mason and I also played with the Dino Track Discovery Pack. This is a fun game for kids of all ages! Basically, you have to follow dinosaur tracks to find out whose footprints you are following. Once you get to the end, you can flip the leaf card to find out who you have been following. You can also find the egg card for additional challenge activities. The challenges include trying to walk the actual steps of a T. Rex and Triceratops. The first set of track I set for Mason were Buddy's tracks. He followed along the tracks and I showed him that when you turn the card over, there was a picture of a dinosaur and a fun fact about it. He turned over each card and I read him the dinosaur name and the description. When we got to the end, he turned over the leaf card to discover the it was Buddy's tracks we were following. The game suggests to set all three sets of tracks to play, but I found that one set of tracks at a time was sufficient for Mason. It also extended the play of the game since each time we played, there was a new set of tracks to follow. I loved that this games extends beyond the TV show. You can teach your child fun dinosaur facts that will carry over and be reinforced when they do watch Dinosaur Train or even read a book about dinosaurs. Included in the Dino Track Discovery Pack are 10 cards printed to look like Tank's Stegosaurus tracks, 10 cards printed to look like Tiny's Pteranodon tracks, 10 cards printed to look like Buddy's Tyrannosaurus Rex tracks, a Tiny card, a Buddy card, a Tank card, and two egg-shaped cards, one printed with the Dino Activity Challenges and the other printed with directions for using the footprint cards. This game is appropriate for ages 3 and up. It retails for about $12.99. Find out more about Dinosaur Train toys online at Uncle Milton. Thanks to Uncle Milton for providing the items above in order to facilitate this review. All opinions are 100% mine.